Burnout continues to be a pervasive issue among physicians. 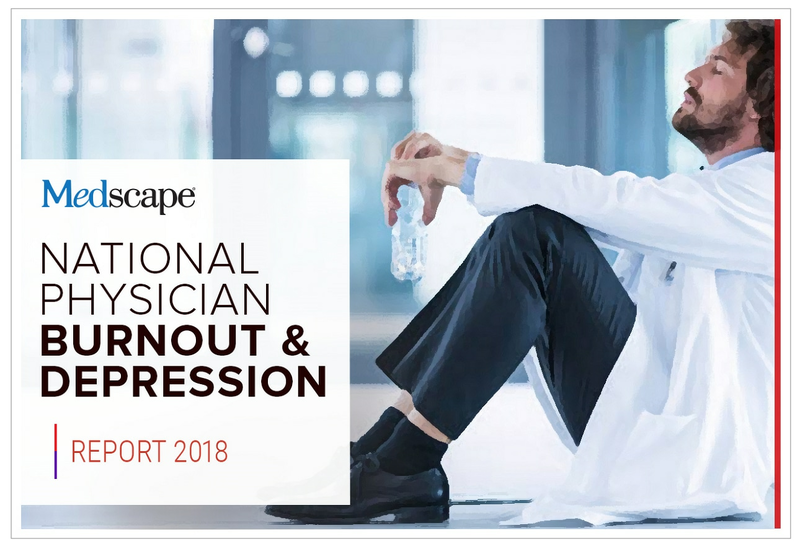 This part of Medscape's annual Physician Lifestyle Report focuses on their responses to our survey questions about burnout and depression. How prevalent are these factors, and how do they affect physicians' lives? More than 15,000 physicians from 29 specialties responded. Among physician respondents, 42% reported burnout. Fifteen percent of all physicians admitted to experiencing either clinical (severe) or colloquial ("feeling down") forms of depression (3% and 12%, respectively). According to the National Institute of Mental Health, 6.7% of all American adults suffered at least one major depressive episode in the past year. The highest rates of burnout occurred among intensivists and neurologists (48%), family physicians (47%), ob/gyns and internists (46%), and emergency medicine physicians and radiologists (45%). The lowest rates of burnout were reported by plastic surgeons (23%), dermatologists and pathologists (32%), and ophthalmologists (33%), all specialists who are less likely to work under emergent conditions. Fourteen percent of all physicians surveyed said they are both burned out and depressed. The highest rates of specialties suffering from both burnout and depression were found among ob/gyns (20%), public health physicians (18%), and urologists and neurologists (17%). In this year's report, as in prior years', a higher percentage of female physicians reported burnout—48% versus 38% of their male peers. The burnout rate climbs dramatically by age, according to this year's report, from 35% of the youngest group to fully half of physicians between 45 and 54 years of age. It then declines to 41% between ages 55 and 69. Work pressures seem to affect employed and self-employed physicians equally, with 42% of each group reporting burnout. While employed physicians may have productivity targets, self-employed physicians have the responsibility of running the business. Physicians were asked to rate factors that contribute to their depression on a scale of 1 (does not contribute at all) to 7 (contributes significantly). Averaging the ratings, the highest contributor for both men and women was their job (5.6 for each). The ratings for men and women were similar for other factors as well, with finances next highest at 3.9 for men and 3.7 for women. Among physicians who reported depression, 40% believe that their depression has no effect on patient care. However, around one third reported that they are more easily exasperated by patients (33%) or less engaged with them (32%) as a result of their depression. Fourteen percent admitted that their depression leads to errors that they wouldn't ordinarily make, with 5% saying that the errors could harm patients. Respondents who acknowledged depression were likely to report an adverse effect on their relationships with colleagues and staff. Forty-two percent indicated exasperation or less engagement with staff and peers, and well over a third said they express frustration around (37%) or are less friendly (36%) to them. Less than one quarter (22%) responded that their depression has no effect on these relationships. Of the physicians who reported depression, 19% described it as clinical (ie, severe depression lasting for some time and not caused by a specific difficult event). A far higher percentage (70%) categorized their depression as colloquial (ie, "feeling down," "blue," or "sad," possibly due to a triggering event). Six percent indicated that neither description applied to their depression. Physicians who reported burnout were asked to rate its frequency on a scale of 1 (rarely) to 7 (always). Nearly half (48%) chose 5 or higher, while only 21% chose 3 or lower. Just under one third (30%) chose 4, exactly in the middle. Respondents who reported burnout could select more than one contributing factor. Over half (56%) chose an excess of bureaucratic tasks, and more than one third (39%) noted too many hours at work. Just 16% chose government regulations, suggesting that administrative burdens came from a number of sources. Physicians could choose multiple factors. Over a third (35%) thought more money would help, and nearly as many (31%) want a more manageable schedule. Although only 16% of respondents said that government regulations contribute to their burnout, more than a quarter (27%) believe that less regulation would lead to a reduction in burnout. When asked how they personally deal with their burnout, half of physicians said they exercise, and nearly as high a percentage (46%) talk to family or close friends. Although a third said they find solace in junk food, very few said they use nicotine (3%), prescription drugs (2%), or marijuana (1%) to cope. There are some differences in how male and female physicians deal with burnout. Notably, a far higher percentage of women than men discuss their burnout with family and friends (55% vs 39%). Men are slightly more likely to exercise than women (52% vs 47%), and more women indulge in junk food (39% vs 27%). Women are also more likely than men to choose sleep as an escape from burnout (46% vs 38%). Female physicians are somewhat more likely than their male peers to seek professional help for burnout, depression, or both. Less than one quarter (24%) of men compared with 31% of women reported that they had been under professional care or were currently seeking or planning to seek professional help. It's hardly a surprise that psychiatrists were the most likely physician group to seek professional help for burnout, depression, or both, but less than half (40%) said that they had done, were doing, or planned to do so. About a third of plastic surgeons (35%), public health physicians (33%), and pediatricians (33%) gave similar responses. Well over half (61%) of respondents in academic, research, military, or government facilities indicated that they are aware of a workplace program to reduce stress or burnout. Nearly as high a percentage (58%) of those in healthcare organizations and 45% of those in hospitals answered affirmatively. Nearly a third (31%) of physicians in office-based multispecialty practices or outpatient clinics knew of such programs. Of respondents who indicated that they are burned out, depressed, or both, and who also had a workplace program to reduce stress or burnout, the highest percentage of those who have used such programs are in solo practice (52%), followed by those in outpatient clinics (30%) and healthcare organizations (29%). Ophthalmologists (37%), orthopedists (35%), plastic surgeons (35%), and pathologists (34%) were most likely to report that they are very to extremely happy at work. The lowest percentages occurred among cardiologists (21%) and three generalists: internists (21%) and intensivists and family physicians (both at 22%). Physicians who reported that they are not burned out were asked to write about how they deal with work-related stress. Most often, these respondents said they maintain a positive attitude about their jobs, strive to manage their expectations, and try to balance their work and home lives. Some, however, are just lucky: They have flexible schedules, work part-time or locum tenens, have supportive colleagues, or enjoy a good workplace environment. Physicians offered advice about how to reduce stress and burnout. The National Institute of Mental Health. Major Depression Among Adults. https://www.nimh.nih.gov/health/statistics/prevalence/major-depression-among-adults.shtml Accessed November 16, 2017.